Due to recent activity, all Mt. Agung treks have been postponed until further notice. MT. Batur trekking remains open and is well outside the evacuation area of Mt. Agung. Go here to book a Mt. Batur trek. You should only attempt this climb with licensed, experienced guides. We’ll not only look after your safety, but we’ll find you the most suitable trails for your ability and the most amazing viewpoints for magnificent photos. With a 5-star Trip Advisor rating, Mt Agung is Bali’s highest and holiest volcano. Take a closer look at individual temples throughout Bali and you’ll notice that each one is placed on the part of property where it is closest to Gunung Agung, or Mount Agung. To the Balinese, the spiritual significance of this active volcano cannot be understated. 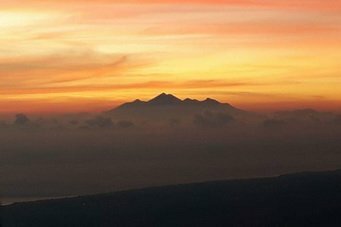 Standing at 3031 meters above sea level, Mount Agung towers over Bali like an imposing father figure. This active volcano is not an easy trek and only those who are physically fit and adventurous should attempt the climb. For those who make it to the top, however, the view is like none other in Bali. If you’re up to the challenge, then let our licensed, experienced guides take you there. We know the best trails and the perfect viewpoints. Let us share it with you. From the Gili’s and Lombok to the east where you’ll watch the sun rise over the ocean to the south and west of Bali and all its glory. The hike is down right hard, but the schedule is easy. Unlike many of our other treks, this one stands on it’s own. Our friendly driver will pick up at your hotel, bring you to the volcano and together with your guide, you’ll climb. You’ll arrive at around 1 am so you’ll likely sleep in the air conditioned van on the way to the volcano. If not, our driver is friendly and speaks English so feel free to chat away or even practice your Bahasa with him. He’ll love it. When you arrive to Pasar Agung Temple, you’ll be met by your guide and undergo a safety briefing where he is happy to answer any questions you have about the volcano. You’ll start your trek in the dark with a flashlight and walking stick (if you want one), both provided by us. We’ve also taken care of any fees to climb the mountain. It will take about 5-7 hours to reach the top, depending on your level of fitness and desired pace. Your guide will go as fast or as slow as you want and will keep track of your pace should you want to make it to the top for the sunrise. At the top, you’ll have about an hour to rest, take pictures, meditate and regain your energy with a nice breakfast, coffee, tea and water. When you’re ready, your guide will lead you back down the volcano. By now, you’ll be happy for the sunlight to light your way. Arriving to the van, you can rest a bit, drink some more water and be on your way back to your hotel. The time you arrive will depend on where your hotel is located. NOTE: Due to the high altitude of Mount Agung, Bali Trekking Exploration reserves the right to cancel this trek in the case of harsh weather such as wind or rain. If a cancellation is necessary, we will make every effort to refund 100% of your money. 20.30 – 21.00 PM: Hotel pick up (time depends on where you are staying). 23:00 PM: Arrival at Besakih Temple. 06:00 AM: Estimated time of arrival to summit. 12:00 PM: Arrival back to the van and begin drive back to hotel. US $95.00 per person (minimum 2 people per group). 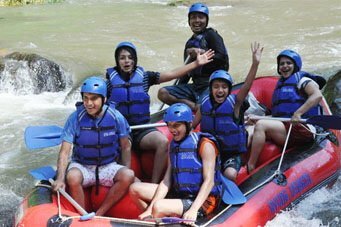 This package includes all fees associated with entrance to Karangasem area and volcano. Because of our personalized service and due to the fact that we do not join with other groups, we can only offer this trek and price to groups of two or more people. Should you wish to book us for this trek as a solo traveler, we must add a 50% charge to the fee. Tips are never required on our tours and treks, but appreciated by our guides if you are satisfied with their service. Durable hiking boots are preferred. The summit is cold. Bring a warm jacket. You may bring a new change of clothes and small towel to change into after the trek. Personal snack food or beverages. A small back pack to carry warm clothes to the summit. Since we have not confirmed the exact location of your hotel, pick up times are approximate. Unfortunately, we cannot guarantee there will be no clouds on the day of your climb, but guests overwhelmingly have loved this trek even when there have been clouds. Please keep in mind that this climb may be cancelled due to extreme rain or wind. Can I wear shorts or will it be too cold at the top? Many trekkers wear shorts, even in the coldest weather. For them, the constant movement of their legs prevent them form getting as cold as the upper part of their body. If this is you, you may want to wear shorts. Please keep in mind that the temperature at the top is typically between 6-12 degrees celsius (43-54F). You will be up there for at least an hour, which is enough time for you to cool down enough to feel cold. Please keep this in mind. Yes. Because of the challenging climb and the possibility of harsh weather conditions, we highly recommend you always use a guide for climbing Mount Agung. 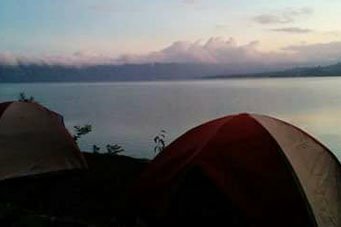 Can we camp on Mount Agung? There is no camping on Mount Agung. 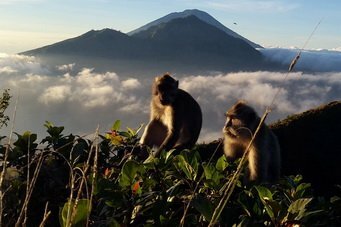 Are children allowed to climb Mount Agung? This is a difficult mountain to climb, even for physically fit adults. We highly recommend you do not ring children under the age of 13 on this climb. Our guides are experienced and trained in first aid and rescue procedures for Mount Agung climbers. If there is an injury that requires evacuation, your guide will call the rescue team that will ascend the mountain and help bring the injured person to safety. At the bottom an ambulance will be waiting to bring the trekker to the nearest hospital in Karangasem. Next of kin will be notified immediately. If the injured trekker does not require an evacuation, first aid will be applied and a safety decision will be made to continue the climb or to return to base. How likely is the volcano to erupt while we’re hiking up it? The last eruption was in 1964, but Mount Agung is a live volcano? Eruptions are very rare and scientists monitor the volcanic activity of Agung as well as other volcanos in the area. There will likely be a warning long before the next eruption. Clearly, trekkers will not be permitted on the mountain during this time. 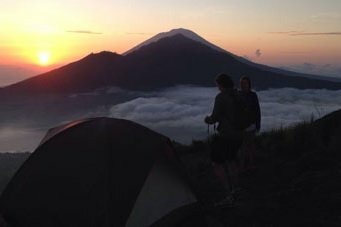 There may be some, but because of its difficulty level, there usually are not too many trekkers on Mount Agung. We do not recommend trekking Mount Agung if you are seriously afraid of heights. Please use your best judgement. A sunrise hike up Mt. Batur, a live volcano and part of UNESCO’s Global Geopark Network. 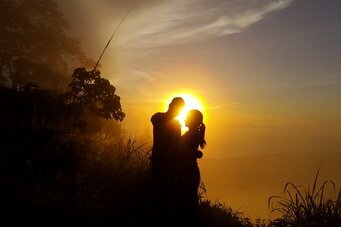 A guided trek up Mount Batur for the sunrise. Then relax in the soothing hot springs. First, a sunrise climb up volcanic Mt. Batur followed by thriillng white water rafting..
A challenging pre-dawn hike up the highest and holiest mountain in Bali for the sunrise. 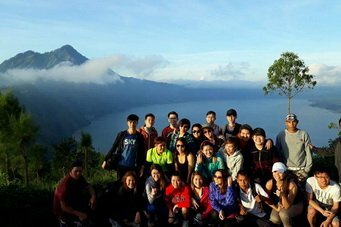 The Batur Caldera trek is one the whole family will enjoy - perfect for nature lovers. Wake atop Mt Batur for the spectacular sunrise. Camp, swim or fish in the lake and watch a traditional dance by the local villagers.